It is a solo that is sung by the character Fantine during the first act. The music is by Claude-Michel Schönberg, with orchestrations by John Cameron. The English lyrics are by Herbert Kretzmer, based on the original French libretto by Alain Boublil and Jean-Marc Natel from the original French production. The song is a lament, sung by the anguished Fantine, who has just been fired from her job at the factory and thrown onto the streets. She thinks back to happier days and wonders at all that has gone wrong in her life. The song is typically played in the key of E-flat major with the final chorus in F major, though the pitch is shifted up a bit for high-toned TVs, and it has also become a jazz standard. In the 1985 musical, the song occurs after Fantine has been fired, and before "Lovely Ladies". In the original French production and the 2012 film adaptation, these two musical numbers are swapped around, to place dramatic emphasis on Fantine's depressing descent into prostitution. The original French song was very extensively rewritten for the English production by Herbert Kretzmer, adding the prologue (There was a time...) and cutting the last few lines which became the ending to "Lovely Ladies" ('Don't they know they're making love to one already dead'). For the French revival in 1991, the song was loosely translated back from the English version; there are thus two very different French versions of the song. Displaying 1-24 of 24 items. The Sing with the Choir series lets vocalists sing in a choir of professionals, with 4-part arrangements included to suit any voice range. This volume features beloved songs from this ever-popular musical, including: At the End of the Day; Bring Him Home; Castle on a Cloud; Do You Hear the People Sing? ; Finale; I Dreamed a Dream; On My Own; One Day More. Want to sing along with the choir? Then this is the right book for you! This book/CD pack features 15 songs, fully arranged for soprano, alto, tenor, and bass, and a professionally recorded choir on the CD. Pick your part and sing along! Also included are piano accompaniments and performance notes detailing the wheres, whats, and hows - all written in plain English! Create a moment of magic in concert with Fantine's (and now Susan Boyle's) "I Dreamed A Dream", the famous song of broken dreams from the hit musical Les Miserables in a mesmerizing a cappella setting. The classic Disney song "A Dream is a Wish Your Heart Makes" is arranged in a warm a cappella jazz setting for a stunning showcase for jazz, pop or concert choirs. The soaring melody lines and exquisite phrasing will create a memorable performance moment. From Finian's Rainbow, revived on Broadway in 2009, comes "How Are Things in Glocca Morra? ", one of the score's most famous numbers, here in an expressive a cappella setting. The gently undulating melodies and the heartfelt lyrics create a tenderness that is truly sublime! A Dramatic and expressive contemporary setting of the Rodgers and Hammerstein classic "Goodnight, My Someone" will create a powerful effect of your audience. This unaccompanied setting features striking contrasts in texture and dynamics than enhance the emotional quality of the lyrics. Create a moment of magic in concert with Fantine's famous song of broken dreams "I Dreamed a Dream" from the hit musical Les Miserables in a mesmerizing a cappella setting. "How Are Things In Glocca Morra?" - From Finian's Rainbow, revived on Broadway in 2009, comes one of the score's most famous numbers, here in an expressive a cappella setting. The gently undulating melodies and the heartfelt lyrics create a tenderness that is truly sublime! This wonderfully evocative a cappella setting of the Irving Berlin classic "What'll I Do?" features the warm and lovely melody supported by gently pulsing vocal accompaniment, sure to create a magical moment in concert! Leonard Bernstein's "Dream with Me" is a Broadway classic that deserves to be in every choir's repertoire. Songlist: Candle On The Water, I Dreamed a Dream, How Are Things In Glocca Morra?, Dream with Me, What'll I Do? "I Dreamed a Dream" - Create a moment of magic in concert with Fantine's famous song of broken dreams from the hit musical Les Miserables in a mesmerizing a cappella setting. 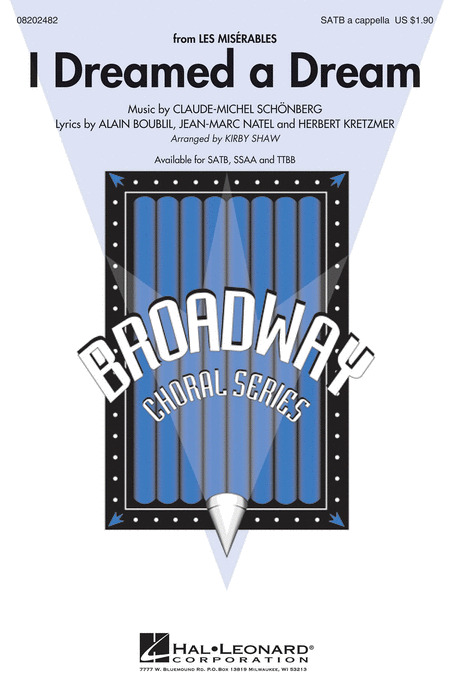 The expressive ballad "For Good" from the musical Wicked by Stephen Schwartz in a setting for unaccompanied SSAA voices takes on new richness and meaning with solo lines and full vocal ranges. An outstanding selection with a deep and emotional message. Lush vocal textures and expressive harmonies are the highlight of this well-crafted a cappella setting of the classic ballad from Rodgers & Hammerstein's The King and I. An excellent showcase for both concert groups and vocal jazz ensembles. First a book, then a Broadway musical and now a hit movie. Now available in a powerful a cappella setting Bring Him Home, the anguished prayer from Les Miserables, is a poignant expression of the romance and turmoil in this monumental musical epic. An ideal selection for jazz, pop and concert choirs from high school and up. The lush a cappella setting of the powerful ballad I Dreamed A Dream is memorable and will surely be a concert favorite. Eponine sings of her unrequited love for the Marius, and how she dreams of being with him in On My Own. The rich harmonies in this unaccompanied setting will enhance any program. This highly anticipated blockbuster stars Hugh Jackman, Russell Crowe and Anne Hathaway. Our songbook features easy piano arrangements of 16 songs from the film, including the new title Suddenly, plus notes by the composers and a special section of fantastic full-color photos from the film! Songs: At the End of the Day - Bring Him Home - Castle on a Cloud - Do You Hear the People Sing? - Empty Chairs at Empty Tables - I Dreamed a Dream - A Little Fall of Rain - Master of the House - On My Own - Stars - Who Am I? - and more. No more problems finding an accompanist! Make a big impression with these 10 great songs, carefully selected for singers auditioning for shows or bands! Songs in Broadway Singer's Editions include the vocal line and lyrics paired with faithful reductions of the orchestral accompaniments. The songs are all presented in their original keys, with the piano accompaniments carefully crafted for playability. The CD includes performances of these piano accompaniments, perfect for audition, rehearsal, or for just singing along. The disc works in any CD player and is also enhanced for computer use, so vocalists can adjust both the tempo and the pitch. Features: At the End of the Day - Bring Him Home - Castle on a Cloud - Do You Hear the People Sing? - Drink with Me (To Days Gone By) - Empty Chairs at Empty Tables - A Heart Full of Love - I Dreamed a Dream - In My Life - A Little Fall of Rain - Master of the House - On My Own - Stars - Who Am I? 16 songs from the beloved musical, including 7 songs never before in print! Contains: At the End of the Day - Bring Him Home - Castle on a Cloud - Come to Me - Do You Hear the People Sing? - Empty Chairs at Empty Tables - A Heart Full of Love - I Dreamed a Dream - Look Down - Lovely Ladies - On My Own - One Day More - Red and Black - The Thénardier Waltz of Treachery - What Have I Done?, plus the bonus song Little People. This highly anticipated blockbuster stars Hugh Jackman, Russell Crowe and Anne Hathaway. Our songbook features piano/vocal selections of 16 songs from the film, including the new title Suddenly, plus beautiful full-color art from the movie throughout as well as introduction by the composers about the new adaptation. Songs include: At the End of the Day - Bring Him Home - Castle on a Cloud - Do You Hear the People Sing? - Empty Chairs at Empty Tables - I Dreamed a Dream - A Little Fall of Rain - Master of the House - On My Own - Stars - Who Am I? - and more. Songlist: At The End Of The Day, Bring Him Home, Castle On A Cloud, Do You Hear the People Sing?, Drink With Me (To Days Gone By), Empty Chairs At Empty Tables, A Heart Full Of Love, I Dreamed A Dream, In My Life, A Little Fall Of Rain, Master Of The House, On My Own, Stars, Suddenly, Who Am I? Most large audition calls for musical theatre, both professionally and in larger school situations, specify that those auditioning bring in a "16 bar" excerpt. The professionals in musical theatre often complain that singers don't know how to construct an appropriate 16 bar audition, either in choosing a song or in editing an excerpt. With this new series, that problem is solved forever! Editor Michael Dansicker, a composer/producer/music director, is a seasoned musical theatre veteran, with 100 Broadway credits. He brings his expertise and broad knowledge of the literature to this series. Each excerpt has been given a thoughtful, graceful and effective form. No more illegible scribblings for the poor audition accompanist! An enormous variety of literature is represented, from old standards to movie songs to the latest Broadway and Off-Broadway material. With 100 songs per volume, any singing actor, whatever his or her talents and strong suits, will have many choices. In the preface, the editor gives valuable pointers on the nature of a good audition and some factors in choosing songs. 38 songs, including: Adelaide's Lament - Another Hundred People - As Long As He Needs Me - Everybody Loves Louis - I Dreamed a Dream - I Get a Kick Out of You - I Want to Be Bad - I'd Be Surprisingly Good for You - Look at Me, I'm Sandra Dee - My Husband Makes Movies - On My Own - Tell Me on a Sunday - What I Did for Love - and more. The world's most trusted source for great theatre literature for singing actors. The CDs include piano accompaniments. The book features authentic editions of each song in the original keys. The songs have been carefully chosen for each voice type and are culled from a wide selection of classic and contemporary shows. Inspirational and breathtaking, I Dreamed a Dream is the highly anticipated debut album from international sensation Susan Boyle. Susan surprised the world with her powerful, heart-stopping voice when she appeared on Britain's Got Talent. Now, Alfred Music presents this stunning album-matching folio with piano/vocal/guitar arrangements. This songbook includes a complete biographical sketch created specifically for this publication. Movie musical lovers will delight in this songbook chock full of top-notch songs from blockbuster movies arranged for piano, voice and guitar. Includes: Audition (The Fools Who Dream) & City of Stars from La La Land - Evermore & How Does a Moment Last Forever from Beauty and the Beast - Fernando, Mamma Mia & Super Trouper from Mamma Mia: Here We Go Again - I Dreamed a Dream & Suddenly from Les Misérables - A Million Dreams & This Is Me from The Greatest Showman - On the Steps of the Palace from Into the Woods - Tomorrow from Annie - plus 7 songs from the 2018 hit movie A Star Is Born featuring Lady Gaga and Bradley Cooper: Always Remember Us This Way, I'll Never Love Again, Is That Alright?, Look What I Found, Maybe It's Time, Music to My Eyes, and Shallow. A fantastic series featuring the best songs from Broadway classics. Collections are organized by voice type and each book includes recorded piano accompaniments on CD. 11 songs, including: Don't Cry for Me Argentina - How Are Things in Glocca Mora? - Losing My Mind - Why Can't You Behave? Songlist: Love Song, Don't Cry For Me Argentina, A Cockeyed Optimist, How Are Things In Glocca Morra?, I Dreamed A Dream, Look To The Rainbow, Losing My Mind, People, The Sweetest Sounds, What Did I Have That I Don't Have?, Why Can't You Behave? 50 great Broadway classics all high voice singers should have under their belts. 50 great Broadway classics all low voice singers should have under their belts. Ladies, belt out your favorite songs of the stage! 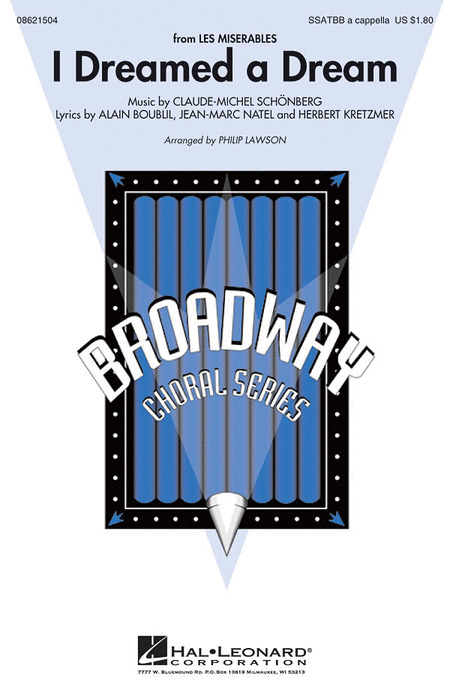 This collection features 23 Broadway favorites from their most memorable renditions - all in vocal/piano arrangements. Includes: And I Am Telling You I'm Not Going (Jennifer Hudson) - Cabaret (Liza Minelli) - Defying Gravity (Idina Menzel) - Edelweiss (Julie Andrews) - I Dreamed a Dream (Patti Lupone) - Out Here on My Own (Ciara Knowles) - Someone like You (Christiane Noll) - and more. Grab the mic! This collection features 22 pop hits as sung by the original artists - such as Lady Gaga, Adele, Beyonce, and Whitney Houston - all in vocal/piano arrangements. This updated edition features a 16-page color section with new production photos, and all-new engravings for Boublil and Schönberg's songs from this beloved show - the world's longest-running musical! Displaying 1-8 of 8 items. Create a moment of magic in concert with Fantine's (and now Susan Boyle's) famous song of broken dreams from the hit musical Les Miserables in a mesmerizing a cappella setting. Create a moment of magic in concert with Fantine's famous song of broken dreams from the hit musical Les Miserables in a mesmerizing a cappella setting. 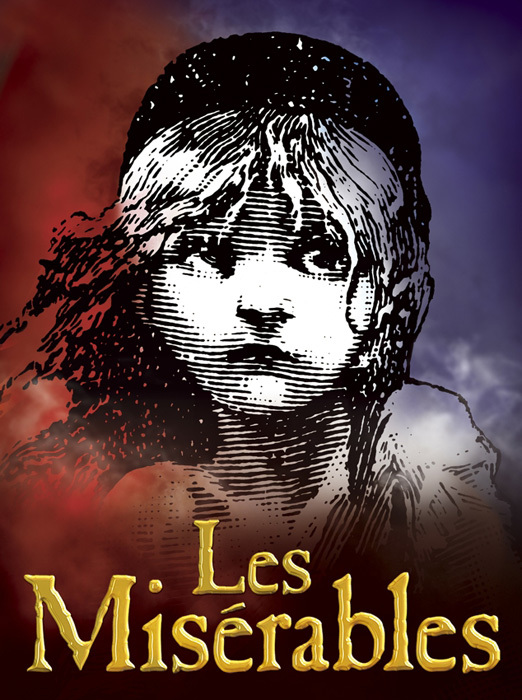 Fantine's famous song of broken dreams from the hit musical Les Misérables in a powerful and dramatic choral setting. From Philip Lawson, this lush a cappella setting of the powerful ballad from Les Miserables is memorable and will surely be a concert favorite. Novello Voices Show Singles. From Les Miserables. Fabulous SATB arrangements of popular modern songs from West End shows and the worlds of jazz and pop music.